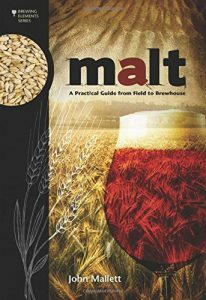 If you are a homebrewer looking to understand the underlying ideas, terminology, and techniques behind malt, this is a great book for you. This book is less of a homebrewing guide about malts and more focused on in-depth and technical subjects covering topics like malting process, maillard reactions, barley types, enzymes, etc. This book covers those topics particularly well and is written by a highly respected member of the craft beer industry. The book does fall short on tying those topics discussed back to homebrewing. However, it offers great value if you understand that going in and plan to learn and do your own research on malts and how they interact and affect your homebrew. Brewers often call malt the soul of beer. Fourth in the Brewing Elements series, Malt: A Practical Guide from Field to Brewhouse delves into the intricacies of this key ingredient used in virtually all beers. This book provides a comprehensive overview of malt, with primary focus on barley, from the field through the malting process. With primers on history, agricultural development and physiology of the barley kernel, John Mallett (Bell’s Brewery, Inc.) leads us through the enzymatic conversion that takes place during the malting process. A detailed discussion of enzymes, the Maillard reaction, and specialty malts follows. Quality and analysis, malt selection, and storage and handling are explained. This book is of value to all brewers, of all experience levels, who wish to learn more about the role of malt as the backbone of beer.